What is the best mojo hand, spell kit etc. for gambling (bingo in particular)? A suggestion of Lucky13 was made. I am looking for a candle or two to burn for same reason. That's actually not an easy question to answer. It's like asking, "Which chocolate chip cookie recipe is best?" We all have our opinions. The reason that Lucky Mojo carries so many different good luck gambling oils is that so many folks have their favourites, and since we hand-make everything here, we can poduce short runs of dozens of different formulas. And all of those kits, oils, mojos, and so forth have their own fans and each is someone's favourite! I would love to win a few big games of bingo. I have ordered 2 spell kits and 2 mojo hands but sometimes you have to wait to do them like waxing, waning moon etc. so i know even though I am ordering gambling luck items it will be awhile before I can actually do the spell. I am wondering if any one has a simple thing I can do for gambling luck with the Seals of Solomon and Moses, blessing oil, van van oil, john the conquer oil and matching incenses, power powder sachet, every color candle, alligator tooth and a few other items, also some herbs. Well an alligator tooth is good for gambling I believe. Anoint it with Van Van and carry it as a pocket piece for luck when you go to play. You can use many of the money-drawing and luck-drawing formulas for gambling, since you're trying to win money by being lucky. Black Cat and Lucky Hand are two examples. If your mojo contains a lodestone, you only need to feed it when you remake/refresh the mojo, it doesn't need to be constantly fed like an altar lodestone. I possted a question on Mojo bags and got some great feedback (thank you for helping me), but I still have tons of questions on details that would take months to clear up on this forum. My primary interest is poker, poker, poker, and winning. Please recomend any and all book you think may help me in useing (and maybe making) Mojo bags for this purpose, useing Hoyts cologn, van van oil, and anything else you think would help me achieve my goal. I have a lot of time to read them while I am here in Iraq, so don't be afraid of recomending to many. Miss Cat's book, Hoodoo Herb and Root Magic. You can also search the online book Hoodoo in Theory and Practice. I'd check out the Three Jacks and a King supplies here: http://www.luckymojo.com/threejacksandaking.html Also some Five-Finger root. leineke wrote: Please recomend any and all book you think may help me in useing (and maybe making) Mojo bags for this purpose, useing Hoyts cologn, van van oil, and anything else you think would help me achieve my goal. I would advise you to purchase a ready-made bag from LM if you're new to hoodoo, as that way you'll be sure that it's effective (as not everyone is skilled at doing all kinds of hoodoo), and it's also much cheaper, considering that the basic herbs are $3 per packet, let alone the more pricey curios.. The Black Cat, Fast Luck, Lucky Hand, Money-Drawing, 3 Jacks and a King, Lady Luck line of products (Mojo hands, oils, baths, sachet powders, candles etc.) as well as the Gambler's Gold herb hand wash would be suitable for you. What I like to do is buy oils that complement each other and mix them together for use, but it's up to you, really.. If you're sure you want to made a conjure hand on your own, you could go for things like alligator feet & teeth, rabbit feet, badger teeth, finger bones, a single lodestone, five finger grass, chamomile, comfrey leaf, devil's show strings, lucky hand root.. I could go on for a long time.. You could go to http://www.luckymojo.com/gamblersluck.html and go through all the links. if I was to purchase a fiery wall mojo bag can I dress it with urine or whiskey? I know the oil can be used. Also i just recently bought an expensive kabbalah talisman from israel that protects against all evil. Would that be suffice? shyguy wrote: if I was to purchase a fiery wall mojo bag can I dress it with urine or whiskey? I know the oil can be used. Also i just recently bought an expensive kabbalah talisman from israel that protects against all evil. Would that be suffice? Regarding the Kabbalah talisman, if it's not from Lucky Mojo we can't be of much help, as this forum is specifically meant for advice on LM products only, so please restrain from mentioning non-LM products in this forum. Still trying to get used to this site,its nice to be apart of a group. Im a fan of bingo but my luck is always teasing me. Does anyone know what candles or spell kits i can use to help me win? I have looked at lucky mojo spell kits but cant really find anything that would assit me. Has anyone else required the same thing? I have placed a order yesterday for a bayberry candles but dont have no idea if that helps. Can anyone advise me please on what to order? Many people have done the spells that you ask for. In fact, I had recommended to someone I do work for to do Miss Robin's gambling. I did a reading for this person, and it definitely stated she was coming into money soon. Well, she won about 600 bucks on the tables at the casino, and another 200 bucks on the slots. Although she modified the spell just a tad, it still worked for her. She carried a john the conqueror root, and a badger tooth (i think) to the casino. It worked wonders for her. Every product, and spell can be found on this page. Miss Robin's spell is located at the bottom. I agree with Starsinthesky. Miss Robin's gambling spell is awesome. I've used it with great success. I too, altered the spell a little but I still got amazing results. I also got a Triple Strength Money Drawing mojo from LM. In addition to Miss Robin's gambling spell, you might also want to look at some of the mojo hands that might be appropriate for you such as Lucky Hand, Lady Luck or Money Drawing. All of these mojos come in triple strength. Thanks guys your information is excellent, i have just placed my order on LM so really looking forward to getting started. Hello and thank you for reading my post! I'm in need of advice - I need to gain some luck (more money!) with my "poker-playing" online and I'm wondering, what spell would be most suitable? If you want something in life – reach out and grab it. I would recommend the spell kits aimed at increasing gambling luck - the Three Jacks and a King would be a good start. Make sure to do some cleansing work of yourself and your home first to make sure you are really getting a clean-slate start spiritually speaking, before you go into the drawing work. Chinese Wash for the home and 13-Herb bath are excellent choices. One of my clients did Miss Robin's gambling spell...and she carried a John the conqueror root and she won like crazy lol. I have a question? I read in the forum some time ago that you can write a petition and dust it with powder and put in the left shoe but cannot find the post i have looked for two days. Any help would be great? I am looking to use this to play in a poker tournament this weekend. Thanks all great site and products. I read that also sorry can't help you . Please let me know if you find it and it works? I am looking for that xtra edge for poker. Hello and Blessings galore to all! Ready for today's dumb question? Can a mojo hand with or without spellcasting be used to help me with online casino games, or would it be necessary to be physically present inside a brick-and-mortar casino? Sure you could, as long as the game isn't a scam. Just hold it while you play. Feed it and talk to it. and I"d suggest Fiery Wall of Protection, to keep your money and winnings protected. Stones like that are not a typical aspect of Hoodoo so I am not sure about using them in gambling, although I do know that stones like this are offered at Lucy Mojo since they cater to many traditions outside of hoodoo as well. I would suggest checking out the Crystal Silence League Radio show on the lucky mojo radio network at blog talk radio to see if any of the episodes give suggestions on stones and gambling. I would however recommend you check out Black Cat products (http://www.luckymojo.com/blackcat.html) as they are useful for gambling luck! This book contains 8 pages of mojo hands for money drawing through gambling. 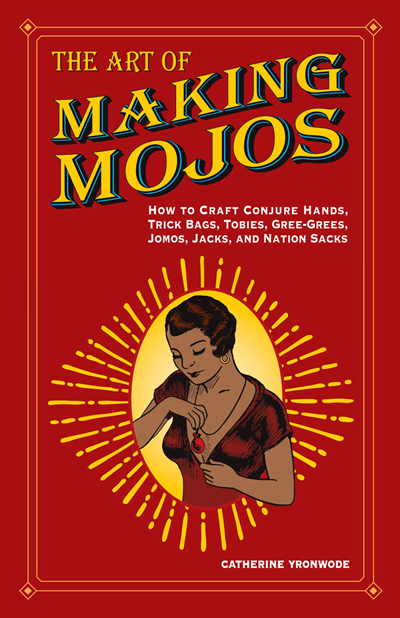 More than 100 mojo hands are described in all.